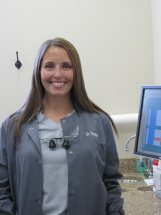 Dr. Erin Thomas completed her Bachelor of Science at Virginia Tech and received her D.M.D. at Boston University School of Dental Medicine. She then attended the prestigious North Shore University Hospital General Practice Residency for two years, serving as Chief Resident. During her training, Dr. Thomas completed a dental externship which provided much needed dental care for the United States Coast Guard. While treating our men and women in uniform, she was awarded The Spirit of Excellence award in recognition of her personal efforts. She continued her passion for donating services, when she traveled to Jamaica for a dental mission where she cared for an underserved community. Dr. Thomas is a member of the American Dental Association, New York State Dental Association, Academy of General Dentistry, and Suffolk County Dental Society. She currently lives in Northport with her husband Justin. She enjoys running and cooking.